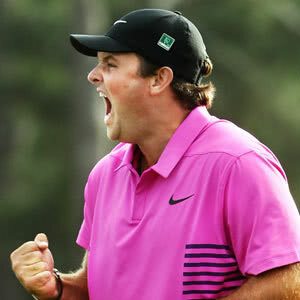 Patrick Reed is an American pro golfer making a name for himself on the PGA Tour thanks to some big wins and a huge dose of self-confidence. Born in San Antonio, Texas in August 1990, Reed won the 2006 Junior British Open and qualified for the U.S. Amateur in 2007. He played for Augusta State University, helping the team to secure the NCAA Division 1 Golf Championship titles in 2010 and 2011 before turning pro later that year. Reed secured his first PGA Tour win in 2013 after a playoff with Jordan Spieth at the Wyndham Championship. In 2014 Reed continued building momentum by winning the Humana Challenge and the WGC-Cadillac Championship. Granting him entrance into an elite group including Tiger Woods, Phil Mickelson and Sergio Garcia as the only golfers to win 3 PGA Tour events by the age of 23. The last victory at Doral also made Reed the youngest winner of a World Golf Championship title. Throughout the 2012 and 2013 seasons Reed’s wife Justine was his caddie. In early 2014 the player’s brother-in-law took over as the couple prepared for the birth of their first child. The Callaway player caused somewhat of a stir after his WGC-Cadillac win for comments he made to the press. Stating he felt he was one of the top-five players in the world. In April 2018 Reed backed up some of that self-confidence by winning his first major title at the Masters. The then-27-year-old held off big names including Jordan Spieth and Rickie Fowler to secure the Green Jacket, finishing with an impressive 15-under at Augusta.